"2 tapes, one for each side of the album one. 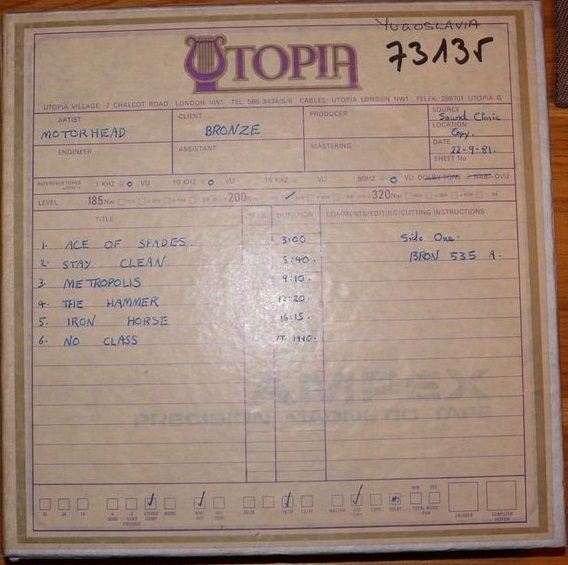 Original UK Utopia village studios, London, reel to reel master tapes from 1981, stereo 2 channel speed 38 m/s, used only once for making vinyl lp No sleep till hammersmith, Bronze/Jugoton label. Tapes were sent to licensing company Jugoton in Zagreb/Croatia (then Yugoslavia). Tapes are original in top shape and condition, for each side of album one tape. They have been carefully stored in Jugoton warehouse for almost 30 years. Boxes are labeled by Emi Abbey road studios, front and Jugoton Zagreb studio's back". That is how this tape was described when it was listed on Ebay in November 2011 by seller progpsych62, located in Zagreb. The Master Tapes are Ampex, Grand Master 456. The boxes have an Utopia sheet attached to the front with hand written track lists.